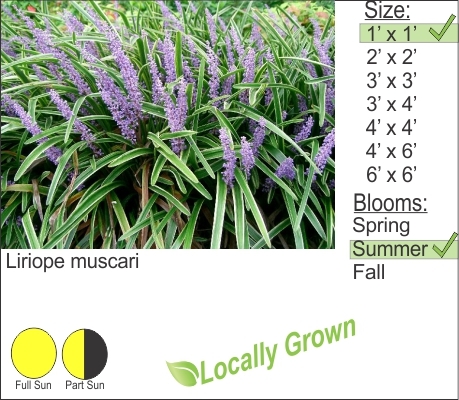 Lily Turf aka Liriope, is a grassy low profile perennial that is perfect for landscape borders and ground cover. Its creamy variegated leaves work well to stand out in the landscape. In moderate winters with heavy snow cover sometimes Lily turf will keeps its foliage from the previous year. Liriope will need to be pruned back annually to encourage new fresh vibrant growth.